– W.H. Murray, via svn. “If someone says: ‘That’s Impossible’. If you want to build a boat, do not instruct the men to saw wood, stitch the sails, prepare the tools, and organize the work, but rather make them long for setting sail and travel to distant lands. Late in the afternoon of May 6th, 1864, Confederate General Jubal Early successfully attacked troops under the command of General John Sedgwick. During that night, General Grant was receiving reports about the “disaster” that had befallen Sedgwick, one of the Union generals expressed grave concerns that Lee would follow up on the Confederate success and move to cut off the Union Army. Some of you always seem to think that he [Lee] is suddenly going to turn a double somersault, and land in our rear and on both of our flanks at the same time. Now, go… and try to think about what we are going to do ourselves – instead of what Lee is going to do. The Lesson: It’s important to know and think about what your competitors may be planning, and the impact that could have upon you… but it is even more important to be thinking about what you could be doing yourself. In order to be open to creativity, one must have the capacity for constructive use of solitude. One must overcome the fear of being alone. An inventor is simply a person who doesn’t take his education too seriously. You see, from the time a person is six years old until he graduates from college he has to take three or four examinations a year. If he flunks once, he is out. But an inventor is almost always failing. He tries and fails maybe a thousand times. It he succeeds once then he’s in. These two things are diametrically opposite. We often say that the biggest job we have is to teach a newly hired employee how to fail intelligently. We have to train him to experiment over and over and to keep on trying and failing until he learns what will work. To believe your own thought, to believe that what is true for you in your private heart is true for all men, that is genius. Speak your latent conviction, and it shall be the universal sense; for always the inmost becomes the utmost and our first thought is rendered back to us by the trumpets of the Last Judgment… A man should learn to detect and watch that gleam of light which flashes across his mind from within, more than the luster of the firmament of bards and sages. Yet he dismisses without notice his thought, because it is his. I’ve always enjoyed Leonard Bernstein. I was reminded of something about Bernstein as I listened to the Minnesota Orchestra perform some of his better known compositions, such as Candide and West Side Story not so long ago. Everything that Bernstein did – he did with his own unique passion. Bernstein was one of the most important musicians of the 20th Century – born in Boston, graduated from Harvard, he got his start as a conductor and instructor with the Boston Symphony Orchestra at their summer home in Tanglewood near Lenox, Massachusetts. He was hired to be the Assistant Conductor of the New York Philharmonic while still in this 20s – based on the strong recommendation of legendary Boston Symphony Conductor Serge Koussevitzsky. “You just couldn’t believe that a young man could create that kind of music. Here were players in their 50s and 60s with long experience. And here this little snot-nose comes in and creates a more exciting performance. 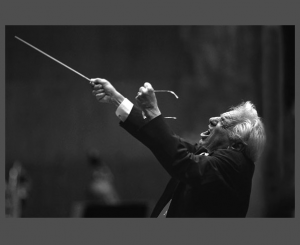 Bernstein brought a level of energy, uniqueness, style, and strong passion to the conductors podium that the staid classical music world had never seen – and hasn’t really seen in the years since. As you can tell by the pictures here – he was just different. He was so energetic that one time he completely fell off of the conductor’s podium during a concert from bouncing around so much while conducting! 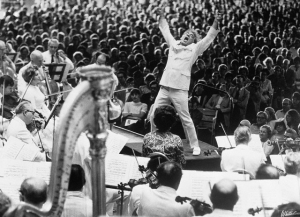 Bernstein went on to serve as the Music Director and conductor of the New York Philharmonic for 11 years – composed many classic pieces – but he always ventured back to where he started each year and would conduct the Boston Symphony at Tanglewood each summer. His last concert, on August 19th, 1990 – not long before his death later that year at age 72, was Beenhoven’s 7th Symphony – on the podium at Tanglewood. Some critics might have said that Bernstein’s energy was not good for the art that is classical music – but what I choose to take away from this is that we should never be afraid to bring energy and passion to what we do – that passion is contagious – as Bernstein showed. We should never be afraid to show our passions about what we do.